Figure A67. North Apennines anomaly, interpreted as the North Apennines slab, with (horizontal) [vertical] cross sections through (A)[D] the UUP07 p-wave) and (B)[D] the combined SL2013 and S40RTS s-wave models at 270 km; C) the location of the modern geological record that we interpret to have formed during the subduction of the slab. is located below Corsica and Tuscany in the upper mantle. Based on early tomographic models, Spakman et al. (1993) interpreted the North Apennines anomaly as a detached slab, but subsequent models rather suggested that it is still connected to the surface (Piromallo and Morelli, 1997; 2003; Bijwaard et al., 1998; Lucente et al., 1999; Spakman and Wortel, 2004). The North Apennines slab is clearly separated from the Calabria slab by a several hundred kilometres wide gap, interpreted as the result of a lateral tear (Wortel and Spakman, 1992; 2000) or a subduction transform fault (Rosenbaum et al., 2008). Lucente et al. 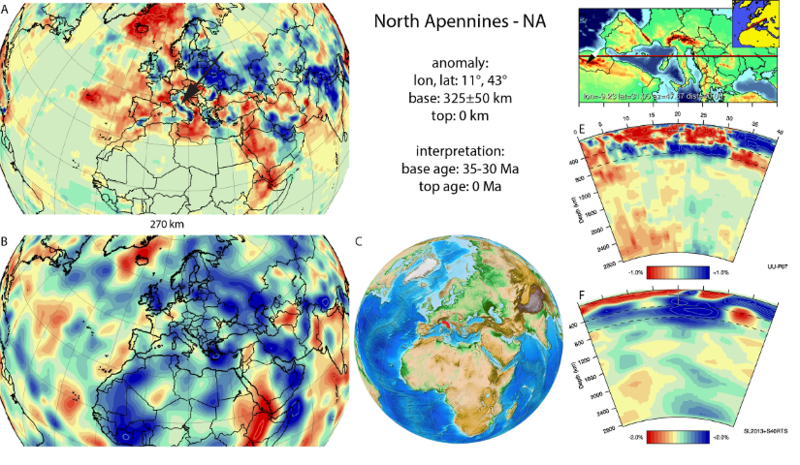 (1999) and Lucente and Speranza (2001) interpreted the North Apennines slab as contiguous with an anomaly lying in and below the transition zone (the Alps slab) by, which would result in a 700 km long slab. Spakman and Wortel (2004), however, suggested that the North Apennines slab reaches a depth of only ~300 km, and is a separate body from the Alps slab. Geological reconstructions of the northern Mediterranean region consistently conclude that the southward subduction zone of the Alps reached as far south as Corsica, based on the finding of a (currently) west-verging thin-skinned fold-thrust belt including high-pressure metamorphic rocks on Corsica (Brunet et al., 2000a). A transition from east- to west-dipping subduction below Corsica, coinciding with the start of the North Apennines subduction zone, is generally estimated to have occurred around 35-30 Ma (Rosenbaum et al., 2002a; Jolivet et al., 2009; Argnani, 2012; Advokaat et al., 2014b). Because the North Apennines slab is oriented at a high angle to the Africa-Europe convergence direction, almost all of its length should have been accommodated by back-arc extension in the northwest Mediterranean, which at the latitude of the North Apennines slab is on the order of 300 km (Faccenna et al., 2001; Faccenna et al., 2004). We therefore follow the interpretation of Spakman and Wortel (2004), and assign an age to the base of the North Apennine slab of 35-30 Ma. Thank you! We fixed it.